The recent successes of the opposition forces in Libya have prompted a second outpouring of comparisons between Iraq and Libya as well as another bout of compilations of dos and don’ts in a post-conflict reconstruction environment. As the entire Middle East region goes on holiday for the Eid this week, it is worth reflecting for a moment on one particular aspect of the Iraq-Libya comparison that has failed to receive much attention thus far: The approach adopted by the respective oppositions to questions of territoriality and state structure during their periods of transition. In Iraq, of course, one of the main watchwords in the post-2003 setting was “federalism”, which thanks to Kurdish and American pressure had been grudgingly accepted by the Shiite Islamists during the opposition conferences of 2002. At first, the Shiite embrace of federalism had been seen mainly as a concession to the Kurdish desire for autonomy within the Kurdish-majority areas, but gradually, some of the Shiite Islamists developed an interest in federalism themselves and tried to combine it with sectarian rhetoric. The crucial point of transformation in this regard appears to have been the negotiations over the Transitional Administrative Law in 2004, in which Adel Abd al-Mahdi of the Shiite Islamist ISCI used the argument that “everything the Kurds have, the Shiites shall have” to make the concept of federalism applicable to all of Iraq. Of course, ISCI’s subsequent attempt at converting the general Shiite population to a pro-federal position proved singularly unsuccessful; nonetheless the damage had been done and today Iraq still struggles with a constitution from 2005 that remains full of contradictions thanks to the premature and unnecessary introduction of federalism as an option also for governorates outside Kurdistan. It is a refreshing but largely unnoticed sign, therefore, that the new transitional charter of the Libyan opposition does not tinker with the existing state structure in Libya in any way. The charter basically confirms the existing unitary arrangements including Tripoli’s status as the capital. True, there is reference to the flag of the monarchy area – which with its tripartite structure at least does have a federalist origin – but it is fair to say that during the past tumultuous months the old flag has come to signify general anti-Gadhafi sentiment rather than a specific pro-federal stance. Neither “federalism” nor “decentralisation” occurs in the text of the charter at all. These matters will of course require closer attention and more specific solutions as the process of drafting a new Libyan constitution gets underway. Perhaps the biggest challenge for the international community of think tanks over the coming months is to reflect realistically and soberly on Libya’s limited pre-history as a decentralised and federal polity. For sure, the federal past of the country in the 1950s needs to be acknowledged as a historical fact. But the significant role of international players in deepening regional tensions in Libya in the first half of the twentieth century must also be appreciated. There is no need to repeat this, and the lesson from Iraq is that happy-go-lucky experiments with federalism in a transitional setting – often accompanied by well-meant cheering from political-science pundits in international opinion – may well create more problems than they solve. In this respect, despite the promising shape of the Libyan charter, there are certainly warning signs out there. As in the case of Iraq (except Kurdistan) native Libyans calling for federalism appear to remain few and far between, although at least some members of the transitional council are known to be thinking along these lines. But already, Michael O’Hanley of the Brookings Institution – who once posed as an expert on Iraqi nation-building before migrating to Libyan issues via Afghanistan – has suggested a “confederal” formula for Libya. Other Western experts are scratching their heads about the “dilemma” of divvying up Libyan oil revenue, creating problems where none may exist and thinking perhaps too much of Alaska and forgetting that the default setting in most of the Middle East is a centralised per-capita distribution formula for oil revenue. From the vantage point of a UK think tank, one Shashank Joshi declares federalism a necessity in the new Libya. Too many Western commentators seem unable to distinguish between centralism and authoritarianism. 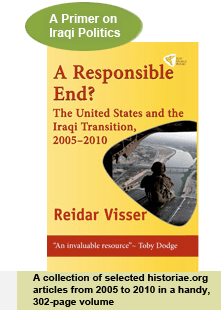 An unneccessary extension of federalism to all of Iraq after 2003 created additional problems for a transition that was already problematic and needs not be repeated in Libya. Throughout the post-2003 period in Iraqi history, one of the distinguishing characteristics of the Daawa political party of Nuri al-Maliki has been its lack of any militia component. This set the Daawa apart from other Shiite Islamist movements like ISCI, the Sadrists and even Fadila (which had paramilitary affiliates at least in Basra). Indeed, during the summer of 2009 when other Shiite parties tried to convince Maliki to join them in a wider sectarian alliance, one of the arguments marshalled by Maliki in defence of going it alone was precisely that his party believed “in the state, not in militias”. Last week, there were some cracks in this image as a previously unknown entity named “The State of Law Knights” (fursan dawlat al-qanun) appeared on the political scene with threatening comments against Kuwait. Unless Kuwait would stop its controversial Mubarak port project, it was said, military and popular action from the Iraqi side of the border would ensue. Despite seemingly frantic attempts by State of Law leaders to dispel the notion of any link between themselves and the new organisation that carries almost the same name, enemies of Maliki seized on the story as evidence that Maliki had finally began formalising a relationship between his own State of Law bloc and a paramilitary organisation. Some even quoted anonymous Sadrist sources to the effect that the controversial tribal “support councils” that were established by Maliki in rural areas from 2008 onwards are in fact now being converted to a new role as paramilitary fursan. So who got it right this time, the conspiracy theorists or Maliki’s people? There does in fact seem to be a degree of substance to the story. The secretary-general of the State of Law Knights is one Abd al-Sattar Jabbar al-Abbudi, who claims to have had “an electoral alliance with State of Law in the 2010 parliamentary elections”. This appears to be correct as far as there does indeed appear a candidate called Abd al-Sattar Jabbar Gati Khalifa on the State of Law list for Baghdad in 2010 who is almost certainly the same person (in 2005 he ran as an independent and was then called Abd al-Sattar Jabbar Gati al-Abbudi), although he seems to have run as an individual on the State of Law list in 2010 and not as the head of a separate entity within the State of Law coalition. As candidate number 114 he was hardly the top pick of the leadership, and he must have got less than the 1,300 personal votes that formed the threshold for winning promotion on the basis of personal votes on the State of Law list in Baghdad. Accordingly, this latest phenomenon appears to be yet another incarnation of something we have seen previously: Political outfits that are clearly pro-Maliki, but that do not enjoy his formal endorsement. This has been seen previously with websites such as qanon302.net (which often but not always toes the Daawa party line). One interesting question is of course why Maliki – who is being described by his detractors as increasingly autocratic – are unable to control these supposedly fringe elements within his very own coalition circles. Could the whole move be deliberate? The term “knights” has been used by Maliki to amplify his rhetoric in the past such as during the “Charge of the Knights” operation in Basra in 2008. As for the Mubarak port issue itself, a good deal of it looks like storm in a teacup designed to redirect attention from the general incompetence of the Iraqi government in making progress on its own harbour projects around Basra. Shiite politicians may find it potentially useful since it distracts from criticism concerning Iranian trespassing on the Iraqi border in the Kurdish areas, but if it is allowed to take precedence at the expense of more pressing domestic issues, Iraq rather than Kuwait is likely to be the main casualty of this whole affair. A strategic policy council, more Arab Spring, or maybe the fall of the Iranian regime? The two articles linked below offer the opinion that the most realistic way forward in Iraq is for Prime Minister Nuri al-Maliki of the Shiite Islamist State of Law alliance to grant the defence ministry to secular Iraqiyya in exchange for Iraqiyya giving up its claim to the national council for high policies – which is likely to prove dissastisfactory even under the rosiest of scenarios. One element in such a move would be agreement betweeen Iraqiyya, State of Law and the Kurds on instructors in Iraq, as argued in “Of Instructors and Interests in Iraq”. Another factor would be a move by those three parties to the deliberately exclude the most pro-Iranian Shiite parties from the Iraqi government and also revert to the pre-2003 oppositional formula of a bi-national federation between Arabs and Kurds – as proposed in “Power Grabs and Politics Are Stalling Progress in Iraq”. Discussion/comments section for both articles is open below. Iraq appears to have entered a late-Ramadan lull, but today the country’s supreme court at least had the whereabouts to make public the full details of its ruling that deprived former interior minister Jawad al-Bulani of his parliamentary seat. The ruling itself is broadly as one could expect. The award earlier this year of a replacement seat to Bulani after Ali al-Sajri of the same Unity of Iraq coalition was promoted to minister of state and its confirmation by parliament in March clearly represented a violation of the law on replacement of deputies since a candidate from Baghdad thereby replaced a deputy from Salahaddin and upset the constitutionally mandated balance of deputies between the Iraqi governorates. It is the governorate argument that recurs in the ruling of the court, but it is interesting that the judges also at one point emphasised that Bulani in fact belonged to a different component (mukawwin) of the Unity of Iraq bloc (kutla) than Sajri (Bulani is from the Constitutional Party and Sajri from Tayyar al-Shaab), thereby raising a problem that could become of interest in future cases: Is it the electoral coalition or the individual list that should be used as point of departure for reckoning replacement entitlements? The replacement law from 2006 is ambiguous on this point. What the ruling also makes clear is that the reason Bulani lost his seat was that politicians from Salahhadin actively filed appeals against the parliamentary decision to approve the replacement candidates in March. Presumably the reason why the court has not stripped two Shiite Islamist replacement deputies of their seats despite their cases being identical to Bulani’s is simply that no one from Bagdhad complained that Jawad al-Shuhayli, a Sadrist who ran in Dahuk, was given one of their seats and that Muhammad al-Hindawi, from Fadila in Karbala, was given another. Of course, Baghdad already has far more deputies than anyone else and its politics is less transparent, but the whole story inevitably smacks of a certain degree of backroom dealing inside the Shiite alliance. Apparently, then, in this case the court has simply responded to those complaints that were filed and ignored the other cases. It will be interesting to see if new cases arise in the case of the ex-ministers that were given back their seats in parliament by the consultative assembly of the state. The details of that ruling, which is arguably far more controversial, have yet to be published so far. It sounds perhaps more exciting than it is: The oil and gas committee of the Iraqi parliament has presented a rival oil and gas law to the version that has stalled in government since 2007. The remaining features look similar. Just like the original bill introduced in 2007, the oil ministry is deprived of effective power which instead rests with the powerful oil and gas commission. The commission will have veto rights on deals entered into also by federal regions, though unless it manages to make a two-thirds decision on them, they will automatically become valid. Producing governorates are not given the same contracting rights as federal regions, which is a blunt violation of the constitution (which treats governorates and federal regions exactly in the same way as far as energy questions are concerned). The reason the parliamentary version has got that much attention despite the minuscule differences relates instead to procedure: By doing what they do in this case, the oil and gas committee are challenging the government and the Iraqi federal supreme court on the rules for introducing bills to the Iraqi legislature. The court has previously established that a bill must pass through the government or the presidency before it is presented to parliament, meaning that the Iraqi national assembly has an impaired right of legislative initiative. Last time parliament tried to challenge the ministry in this way (through a law that severed the administrative ties between governorates and the municipality and public works ministries) it ended up with rejection by the federal supreme court and the law in question was subsequently annulled. In other words, the parliament version of the oil and gas bill could easily be struck down by the court on the same procedural grounds. This in turn relates to the politics behind the move to introduce a parliamentary version of the oil and gas bill. Interestingly, the Kurds and Iraqiyya are seen as the driving forces behind the new bill, whereas resistance to it has been recorded above all by the State of Law alliance headed by Prime Minister Nuri al-Maliki. That clearly explains the stronger role for parliament in appointing the commission in their version of the bill, as well as the resistance to the bill on both substantial and procedural grounds by State of Law. One interesting feature is that the Kurds are now moving ahead with a bill that will give the central commission veto right over all contracts: It is believed disagreement between the Kurds and Shiite Islamists has been a key reason for the delay in presenting the government version of the bill to parliament. Perhaps more than anything, the parliamentary version of the bill illustrates the length to which Iraqiyya is prepared to go in order to hurt Maliki personally, no matter what the ideological issues at hand are. Here we have a draft law that was almost uniformly rejected by Iraqi oil experts – mostly Iraqiyya supporters – when it first appeared in 2007. The essence of the law remains pretty much the same, but now Iraqiyya are lending their support to a project that will reduce the ministry of oil to a chamber of pontification and put all real power in the hands of a commission of politicians and a few “independent experts”. For their part, the Kurds are significantly conceding veto rights over contracts to a centrally politically commission, albeit one with a parliamentary mandate as well as a two-thirds requirement for reaching decisions. But the wider point must be this: The Kurds have managed to persuade Iraqiyya to back yet another commission of politicians at the expense of bureaucrats. The conceptual cousin of the oil and gas commission is of course the national council for high policies, backed by Iraqiyya and the Kurds as well and resisted by Maliki. To an outside observer they both look pretty much like the products of a political science kindergarten, and it is remarkable how the Kurds have managed to convert Iraqiyya with its supposedly Bonapartist ideals to a position that may well contribute to ever greater fragmentation. To add insult to injury, Iraqiyya claim to be “building the institutions of the state”! The only player on the Iraqi scene that seems focused on normal, recognisable state institutions right now is clearly Nuri al-Maliki, but the failure of the two camps to communicate runs the risk of creating growing polarisation and with it a vicious cycle of ever more authoritarianism on the part of Maliki. It is also interesting that the Kurds in this case are working through parliament (and its speaker, Usama al-Nujayfi of Iraqiyya) rather than through the presidency and their own Jalal Talabani (who introduced the strategic policy council bill). Could it be that some kind of Talabani-Barzani disagreement on how to navigate between Iraqiyya and Maliki is lingering in the background in this case? The newswires began reporting this item yesterday and today it has been generally confirmed: Prime Minister Nuri al-Maliki has appointed the culture minister, Sadun al-Dulaymi, as acting minister of defence. Dulaymi held the same portfolio in the Ibrahim al-Jaafari government in 2005-2006. The significance of the appointment relates to two levels. Firstly, in terms of the architecture of the second Maliki government, it means Maliki could be seen as moving towards consolidating a situation in which no regular parliament appointments may take place for some time with respect to the security ministries: In early June he appointed Falih al-Fayyad of the Jaafari wing of the Daawa movement as acting minister of state for national security, whereas Maliki himself continues as acting interior minister. This is a different scenario from what happened in 2006, at which time it was precisely the security ministries that held up the completion of the government after the first posts had been allocated in May, but a solution was subsequently found and the full cabinet was approved by parliament in June. Secondly, at the political level, the latest move is a clear rebuke to the secular Iraqiyya, which has lately signalled unhappiness about the direction in which the second Maliki government is evolving. Whereas Dulaymi may technically belong to the Unity of Iraq faction (which has technically been enrolled in Iraqiyya recently), it is very clear that Dulaymi is not the candidate of the leadership of Iraqiyya. In other words, he is what Maliki sometimes describes as a “Sunni candidate” rather than an Iraqiyya candidate. The more this kind of sectarian logic gets reified in the Iraqi government, the more we get back to the political atmosphere of 2006 when sectarian violence was at its height. The problem with what Maliki is doing is that he continues to act as a strongman with a parliamentary majority in a context where it has been proved time and again that he doesn’t. Firstly, he seems to think White Iraqiyya (a small breakaway faction of Iraqiyya) can provide him with a “secular” cover and Dulaymi can do the same thing in terms of “integrating Sunnis”, but the numbers just don’t add up. Secondly, he keeps forgetting that the all-Shiite National Alliance rarely exists as a true united force in parliament, with the Sadrists, ISCI and other elements frequently disagreeing with Maliki. Indeed, many of Maliki’s own moves to maintain focus on his own, smaller State of Law bloc undermine the idea of a unified Shiite alliance. It indicates a complete lack of realism when Daawa members call the Dulaymi nomination a “move to stop regional influences in the defence ministry question”, which effectively means they dismiss all the 9 named Iraqiyya candidates for defence as stooges of Saudi Arabia and other Gulf states. By circumventing a parliamentary vote, Maliki is trying to consolidate his own power despite his narrow parliamentary support base. The question is how long the other parties will tolerate this. Iraqiyya has already been talking about new elections for a while, though mainly with reference to the stalling process to establish a national council for high policies. Arguably, the defence ministry is a far better issue on which to bring matters to a head: A defence minister from Iraqiyya would deepen its integration into the government, whereas the strategic council is likely to remain a paper tiger. As usual, the swing vote will rest with the Kurds, who have been unhappy about lack of progress on their many demands to Maliki for joining the government, but who at the same time support the conceptual framework of ethno-sectarian quota arrangements that lies behind the Dulaymi appointment. One potentially positive outcome of the appointment of Dulaymi would be the incentive to get rid of the useless culture ministry altogether and maybe merge the three education-related ministries into one: That at least would be in line with the latest signals from the Iraqi public who want an effective government fast. The recent downsizing of the Iraqi government – in itself in some ways a good move – has prompted another bout of legal chaos concerning the rules governing replacement of deputies in the country’s legislative assembly. The latest developments in the matter make up yet another threat to Iraq’s fragile constitutional order and form a depressive backdrop to today’s grim news regarding the security situation. The facts of the matter are as follows. Ever since the downsizing of the second Maliki government came on the agenda and was carried out in late July, some voices have been calling for the restitution of the dismissed ministers as deputies in parliament (i.e. in those cases where a deputy had originally won a seat in the 2010 parliamentary elections and subsequently gave it up upon becoming promoted as minister). It should be stressed that there appears to be no legal basis for restoring the seats in this way. The relevant piece of legislation, the replacement law on deputies from 2006, merely stipulates procedures for how to replace deputies that vacate their seats and does not go into the hypothetical question of dismissed ministers returning as deputies, meaning that as far as the replacement law is concerned, once a seat has been given up it should be seen as irretrievably lost for the deputy that vacated it. Despite these legal aspects, the calls for the ex-ministers to be allowed to return to their seats have persisted. To some extent, the intention may have been to compensate those ministers since their process of dismissal was also one hundred per cent unconstitutional. And yesterday, the so-called “consultative assembly of the state” (majlis shura al-dawla) reportedly reaffirmed the return of the dismissed ministers as parliamentary deputies, thereby providing a cover of legality to the restitution process. Some reports say that ex-ministers that had previously been deputies will be be able to choose between returning to parliament or retiring with a salary. As an institution, the consultative assembly of the state dates back to the days of the former Baathist regime. It is a shadowy court administered by the ministry of justice and only limited information can be found about it in the public domain. In the post-2003 era it has continued to function as an administrative court in those cases where the federal supreme court has been reluctant to issue rulings, including a number of cases relating to provincial administration at the sub-governorate level. Most significantly, the supreme court has sometimes opted to transfer politically contentious cases to the consultative assembly – even in instances when the judicial arguments for doing so have been far from crystal clear. So far the details of the rulings in this latest case have not been published. They should be, not least since the case relates to rather blunt infractions of both the constitution and the law of the land in Iraq. One potential avenue for a more public debate about these issues relates to the fact that some of the ministers involved have already been replaced by new deputies and at least some of these deputies are likely to put up a fight for their newly won seats. For example, it will be interesting to see how Abdallah al-Rashid of Iraqiyya will react if he loses his seat again after having earned it when Salah Muzahim became minister of state: Rashid had been targeted by Maliki during the post-election debate about deputy eligibility, and one cannot help wonder whether his predecessor who eventually became minister of state represented a face of Iraqiyya that was seen as more tolerable by Maliki. Also there are legal cases underway relating to the way in which the ex-Iraqiyya deputy Jamil al-Batikh was replaced by someone from Iraqiyya rather than by a candidate from his new list, White Iraqiyya, which again has emerged as more pro-Maliki than Iraqiyya itself after the two split. A State of Law candidate called Ali Abd al-Nabi al-Rubaye from Basra has also replaced the minister of state for national reconciliation, Amir al-Khuzaie; if indeed Maliki or anyone else in the State of Law coalition has played a role in providing “advice” for the consultative assembly in this case then chances are of course greater that Rubaye will go quietly. All in all, the reluctance of the supreme court to touch this case so far is not terribly promising. It pretty much echoes the situation after the elections in 2010 when it proved similarly unable to rise above political pressures and act in a truly independent fashion. After he formed his own electoral coalition known as Unity of Iraq in summer 2009, former interior minister Jawad al-Bulani has largely disappeared from the limelight in Iraq. His new coalition, which in many ways resembled an Iraqiyya in miniature with a secular ideology, a Shiite leader and a largely Sunni support base, performed poorly in the parliamentary elections of March 2010 and played no significant role in the formation of the second Maliki government in December 2010. But for the past month or so, Bulani has once more attracted the interest of Iraqi media. The first occasion on which Bulani came to the fore again was in July after the merger of his Unity of Iraq bloc with Iraqiyya. Unity of Iraq had originally emerged with only 4 deputies after the parliamentary elections and had first moved to form a post-election alliance known as Wasat with the equally unsuccessful Tawafuq coalition (6 deputies) with which it had few ideological commonalities. After the merger of Iraqiyya and Unity of Iraq, the rump of Wasat – basically the old Tawafuq – for a short while remained independent in parliament. However, recently Tawafuq moved to join Iraqiyya as well. Inevitably, in isolation these moves left a sense of greater sectarian polarisation in Iraqi politics, not least since the only branch of Iraqiyya that defected after the elections – White Iraqiyya – is Shiite-dominated and has recently been strengthened by yet another ex-Iraqiyya deputy from Karbala. For its part, despite Bulani being a Shiite and Unity of Iraq having a certain cross-sectarian appeal, Iraqiyya is certainly looking somewhat more Sunni-leaning after the latest co-option of Tawafuq, which in many ways was the quintessential “Sunni party” in the previous parliament. Soon after the merger with Iraqiyya, some of Bulani’s troubles came to the fore. In an embarrassing development, the leader of Unity of Iraq had failed to win a seat for himself in the March 2010 election. Nonetheless, he was given a replacement seat earlier this year after a member of his coalition, Ali al-Sajri, was promoted as minister of state in the new Maliki government. However, the problem was that Sajri had been a candidate in Salahaddin whereas Bulani had been a candidate in Baghdad, making his replacement distinctly at variance with the law on the replacement of candidates as well as the constitutionally stipulated balance of deputies between the governorates. Finally, in a much-overlooked development, on 10 August the Iraqi federal supreme court announced that it had overruled the Iraqi parliament’s decision on replacement seats and deprived Bulani of the seat that he had been awarded earlier. There are several problems related to the ruling, including the question of why the same principles were not used against several other deputies (including individuals from the Sadrists, Fadila and Tawafuq) whose replacement of other deputies had featured exactly the same problems as those highlighted in the case of Bulani. So far, however, the only lingering protests considering the replacement seats seem to concern the seat given to a member of Iraqiyya after a White Iraqiyya member was given a ministry of state in February, as well as rather implausible protests by ministers affected by the recent downsizing of the government to the effect that they should get their parliamentary seats back (instead, those ministers should have protested the modalities of the downsizing procedure). Just to make matters worse, Bulani recently offered a press statement which left considerable doubt about his ability to read the Iraqi constitution properly: On 26 July, he told media that the Iraqi parliament should be reduced to 163 members, supposedly to reflect the correct proportion of deputies per voter! In fact, what Bulani cited was the old elections law of 2005 and not the constitution. One of the reasons the election law was amended in 2009 was precisely that it was in conflict with the constitution in this regard. At any rate (and possibly not entirely unrelated to the loss of his parliamentary seat and/or the recent merger with Iraqiyya), Bulani is now on the offensive again: He has suddenly become Iraqiyya’s candidate to head the defence ministry. This is an interesting move for numerous reasons. Firstly, back in 2006, Bulani had of course been the “Shiite compromise candidate” for interior (when the formation of the government was also held up for many months precisely due to bickering about who should hold the sensitive security ministries). Secondly, as a secular Shiite promoted by a coalition seen by some of its detractors as “too Sunni”, Bulani creates trouble for anyone who wants to adopt a neat sectarian perspective on Iraqi politics. In this respect, it is noteworthy that Prime Minister Nuri al-Maliki himself has lately tried to label the defence post as a “Sunni prerogative” (rather than the rightful share of Iraqyya) in a sectarian and not too subtle move to circumvent the preferences of the Iraqiyya leaders for this post. Bulani’s re-emergence as a candidate for defence in Iraq is potentially fruitful in the way it makes a mess of sectarian expectations that the defence post should go to a Sunni and interior to a Shiite. But by continuing to push for the strategic policy council, Bulani’s Iraqiyya is clinging to an oversized power-sharing formula for the Iraqi government which remains antithetical to recent public demands for a smaller, more effective cabinet. If Maliki is smart, he will accept Bulani and then see how this move influences internal politics in Iraqiyya, which in terms of numbers of important ministries will then be reasonably and comparatively speaking well integrated into his government after the recent downsizing. Unless Maliki is able to obtain allies outside his own core coalition that are prepared to challenge the strategic policy council favoured by Iraqiyya, an acrimonious debate about the council may well continue to dominate Iraqi politics for weeks and months at a time when focus on a new bilateral arrangement between Iraq and the United States is needed. Conversely, if Maliki is unwise and unrealistic, he will continue the futile search for “Sunnis outside Iraqiyya” to fill the defence ministry post. Bulani, incidentally, is reasonably well liked in the United States for the work he did during his tenure at interior. It may be that Ramadan exhaustion in combination with another hot Iraqi summer has made its impact: In a Byzantine development, the Iraqi parliament today voted “in principle” to continue working on the strategic policy council bill. The procedure adopted today is in itself extraordinary. Normally a bill advances through parliament by way of two separate readings, each of which is followed by discussions and amendments before a final version of the bill is voted on. Nonetheless, at the end of the reading, parliament found it necessary to vote “in principle” on continuing to read the bill! The move was even misreported in some media to the effect that the bill had already been passed. The bill itself is as convoluted and ambiguous as the early versions that circulated. A wide scope of operations is outlined for the projected strategic council, with areas ranging from the energy sector to foreign policy. In practice it amounts to a parallel government in everything but the name, except that unlike the government proper it will not be based on the input from specialised ministries. Just to make matters even more confusing, separate items specified as falling within the jurisdiction of the council include vague national-reconciliation tasks as well as making suggestions for the projected federal supreme court. An interesting new focus is the idea of limiting the council effectively to one parliamentary term, which would give it a certain transitional character. There are however some serious caveats that will limit the power of the council in practice and makes you wonder whether it is worth going through all the trouble of trying to adopt it anyway. Firstly, in order for the decisions of the council to be binding, an 80% majority will be required as per the draft law requirements reported in the press. As is all too well known, 80% agreement on anything is a rarity in Iraqi politics. Secondly, look at the projected composition of the council. It will include the president with his deputies, the parliament speaker with his deputies, and the prime minister and his deputies. Additionally there will be the president of Kurdistan, the head of the federal supreme court as well as two representatives from each of the four major blocs in parliament (incidentally the latter criterion seems to recognise that the so-called National Alliance of Shiite parties is in fact two separate alliances). The point is that these will all be familiar faces that will reproduce the stalemates of parliament rather than bring in new dynamics that can help solve them. And finally, look carefully at the draft law. Early versions seemed to indicate a power to introduce legislation to parliament, making it analogous to the presidency and the cabinet in this respect. However, in keeping with the ruling of the federal supreme court that insists on differentiating between just proposing a law (muqtarah) and preparing it as a fully-fledged project (mashru), the latest draft puts the strategic council on par with the parliament and reserves the right to initiate detailed legislation for the two existing branches of the executive. In sum, if the council is adopted, it is unlikely to be effective in other ways than buttressing the stature of its projected leader, Ayad Allawi of the Iraqiyya coalition. The rest is likely to remain theory, but in this respect it would certainly make Iraq into a crazy-quilt political regime without any clear parallels anywhere in the world. Cohabitation on the French pattern? No, not quite so, since French dualism in the executive consists of a president with a clear popular mandate and a prime minister answerable to the legislative assembly. Also, French presidents and prime ministers have tended to divide the tasks of governing between themselves during periods of cohabitation, whereas the Iraqi proposal looks more like an attempt at creating a second government that will spend most of its energy in Sisyphean attempts at agreeing internally. In fact, if adopted, it would create a tripartite executive in Iraq, alongside the cabinet and the mostly symbolic presidency. If implemented, the council would clearly be antithetical to the spirit of the limited Iraqi spring (with its call for an end to superfluous top government positions) as well as to the recent downsizing of the government (which to some extent represented a response by the government to those new trends in Iraqi public opinion. Resistance to the bill, which is perfectly logical from the constitutional point of view, has however so far been mostly limited to the State of Law bloc of Prime Minister Nuri al-Maliki. Today in parliament, even Ibrahim al-Jaafari reportedly said the bill was broadly compatible with the constitutional framework. Since Jaafari is often seen as closer to Iran and one of the key players in maintaining the sectarian Shiite alliance, it makes you wonder whether Iran, too, is in favour of the formula of more fragmented government in Iraq of the kind that the Kurds have been promoting quite actively over the past years (as seen for example in the way the projected oil and gas council of politicians that is supposed to supplant the regular oil ministry and its technocrats in many important decisions). It seems all the opponents of Maliki are happy to press along with the council despite its glaring weaknesses, with only the Kurdish oppositional Gorran party presenting some good criticism so far, saying Iraqiyya should focus instead on passing legislation for the projected senate (which at least is stipulated in the constitution). A far more workable objective for Iraq would be to drop the council entirely and instead seek agreement on the security ministries that remain undistributed. Lately there have been some positive ideas about possible candidates from within the Iraqi security forces (instead of politicians) that would be nominated from Iraqiyya and State of Law for defence and interior respectively. However, today much of this was characterised by the official Iraqiyya spokesperson as unsubstantiated, and if the debate over the useless strategic policy council continues to consume the energies of Iraqi politicians over coming weeks and months, agreement on the remaining portfolios in the second Maliki government may prove even more difficult to reach. Late Saturday night Iraqi newswires began spreading the news: Prime Minister Nuri al-Maliki had sacked the electricity minister, Raad Shalal al-Ani, because of allegations of questionable deals with foreign companies and corruption. Most media commentators reported the act as a fait accompli and began discussing possible successors to replace Ani. But hold your horses for a moment: Can Maliki really do that? Sack a minister without consulting with anyone else? No, he can’t. Not without the consent of the parliament, as detailed in article 78 of the Iraqi constitution. In other words, the sacking of the electricity minister must be confirmed by parliament in one of its sessions this week. It should be stressed that when Iraqiyya (the political bloc to which the sacked minister belongs) expressed a desire for a different procedure, namely, for the minister to appear before parliament to answer questions before being relieved of his duties by way of an absolute-majority vote, they are not being entirely faithful to the constitution either. It is true that this kind of procedure exists as an option in the constitution, but it is mainly intended as an avenue for parliamentary initiatives to get rid of a minister. By way of contrast, the prime minister’s prerogative to sack a minister does not stipulate any hearing in parliament, and a simple majority will suffice to confirm the action of the PM. Given the serious charges of large-scale, fictitious dealings with two foreign companies, it seems highly likely that parliament will opt to confirm Maliki’s actions in this case. For the time being, deputy prime minister Hussein al-Shahristani will reportedly take care of the vacant portfolio, which is interesting given the recent government downsizing and reports that Maliki is seeking to give all three deputy PMs more specific portfolios. Any permanent move by Shahristani to electricity would in turn affect the contentious balance between Maliki’s State of Law coalition and Iraqiyya in the current government.